Social networking has become an integral part of our life as it helps us stay connected with our friends wherever they are. ‘Social networking mania’ keeps on increasing day by day and several social media websites evolve exponentially over time. There are only a handful of social media sites out there that really serve their purpose. Keek is one such social network that comes in the form of an Android app. What’s the app about ? Keek is a micro-video sharing application which helps you connect with your friends and family by letting you upload mini videos of your updates. It provides you with the easiest way to share quick video updates with your dear ones. What’s special in the app ? The best feature of Keek is that you can create your own profile and post videos within seconds. You can edit your profile whenever you like. You can watch real-time videos of your friends around the world. You have options to share videos on Facebook and Twitter as well. 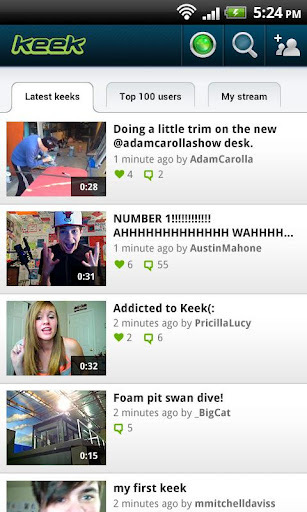 Users can make use of the # and @ symbols in the Keek description to make them noticeable. Keek offers excellent video capture quality and supports both front and rear cameras for taking videos. You can reply through videos for the posted videos using the ‘Keek Back’ option which will amuse you. You can even save a video to upload it later. There is also an option to block and report unwanted users. Once you have launched the app, you can login using your email id and password. You will be taken to the home page which consists of menu items such as Watch, Search, My Profile, Saved and New Keek. Using the New Keek option you can shoot a new video and save it in the Save menu. The video can be edited whenever required. 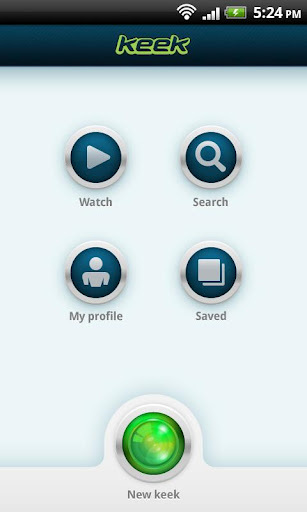 Keek allows you to view the uploads and personal details of the top 100 users using the Watch menu. You can follow or subscribe for any video from the profiles of top users. The app offers well-defined navigation and a structured layout. It provides a novel way to stay in touch with friends through videos. But the app supports footage of only 36 secs, which is a great drawback, in my opinion. Apart from this, Keek is undoubtedly a fun-filled app which hooks all youngsters worldwide. So click and Keek now! Keek is a free app which requires an Android version of 2.2 and above.